The all-stainless steel TMC ClassOne™ Workstation is a high-performance,pneumatic vibration isolation table designed from the floor up for maximum cleanroom compatibility. Isolation is provided by the same Gimbal Piston™ element that provides unsurpassed performance in isolating optical tables, electron microscopes, precision balances, and scanning tunneling microscopes. The ClassOne Workstation is alcohol-wiped with a lint-free cloth and is double-wrapped in plastic at the factory prior to shipping. 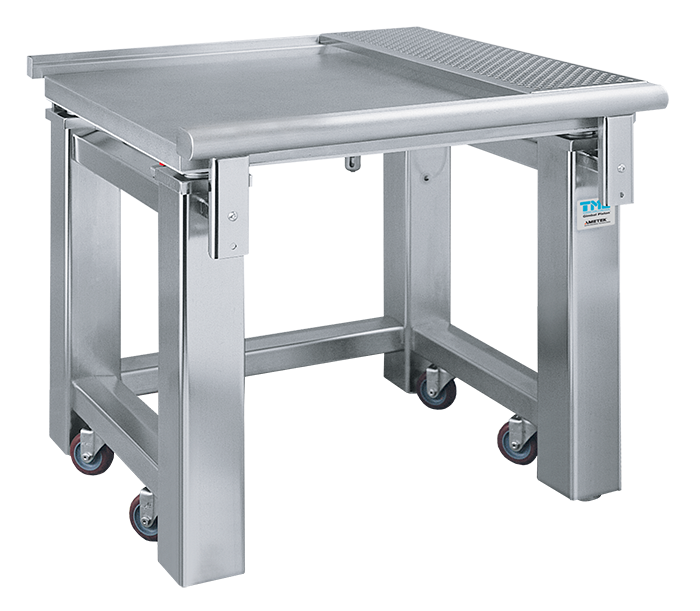 All CleanBench tables incorporate TMC’s Gimbal Piston Air Isolators as a standard feature. The Gimbal Piston has consistently shown to out-perform other air isolators in side-by-side testing. It offers outstanding low frequency vibration isolation in all axes and maintains its performance specifications even when subjected to extremely low input levels of excitation. Proprietary damping techniques allow the Gimbal Piston to stabilize relatively top-heavy payloads and quickly dissipate disturbances of the isolated table top. The Gimbal Piston® Air Isolator provides outstanding isolation in all directions for even the lowest input levels. It is lightly damped and highly responsive to typical, low-amplitude ambient floor vibrations, yet achieves very high damping for gross transient disturbances, such as sudden load changes or bumping the top plate. The result is that Gimbal Piston Isolators provide superior isolation yet will virtually eliminate any gross disturbance within a few seconds. It can also stabilize isolated systems with relatively high centers of gravity without compromising isolation. The greatest challenge in designing an effective isolator is to maintain good performance at the low vibration amplitude inputs typical of ambient building floor vibration. Isolator specifications are often based on measurements done with the isolator placed on a “shaker table” with very high amplitude input levels. Such testing, with input amplitudes on the order of millimeters, yields unrealistic performance expectations and is misleading as results will not reflect the actual performance in use. The Gimbal Piston Isolator design is unique in its ability to maintain its stated resonant frequency and high level of attenuation in even the most quiet, real, floor environments. The performance is linear to such low amplitudes because the design is virtually free of friction and therefore able to avoid rolling friction to static friction transitions. Every other system that we have tested at levels typical for floor vibration exhibits either a higher resonant frequency than claimed or a substantial increase in transmission through the isolator mount. We stress the importance of performance specifications at low levels because we have repeatedly observed, in our own testing and in many as-used installations, that better performance is much easier to achieve at greater amplitudes and higher frequencies. Our innovative Isolator allows a thin-wall, rolling diaphragm seal to accommodate horizontal displacement by acting as a gimbal. Instead of using a cable-type pendulum suspension, the Gimbal Piston Isolator carries the load on a separate top plate that has a rigid rod extending down into a well in the main piston. The bottom of the rod has a ball-end that bears on a hard, flat seat. The result is an inherently flexible coupling which allows horizontal flexure in the isolator as the ball simply rocks (without sliding or rolling) very slightly on the seat. The approach works extremely well, even with sub-microinch levels of input displacement, because the static friction is virtually the same as the rolling friction. Horizontal motion is simply converted to the usual vertical diaphragm flexure but out of phase: one side of the piston up, the other down, in a gimbal-like motion. Thick- Wall Rubber Diaphragms. Most commercial isolators employ an inexpensive, thick-walled rubber diaphragm in the piston to achieve vertical isolation. Because of the relative inflexibility of these elements, low amplitude vibration isolation performance is compromised. Though such a system feels “soft” to gross hand pressure, typical low-level floor vibration causes the rubber to act more like a rigid coupling than a flexible isolator. Sealed Pneumatic Isolators (Passive). Sealed air isolators do not automatically adjust to load changes. The primary limitation of such systems is that they must be made too stiff to be effective isolators. For example, a passive isolator with a true 1.5 Hz resonant frequency would drift several inches vertically in response to small changes in load, temperature, or pressure and require constant manual adjustment. Thus, no practical sealed isolators are designed with such low resonant frequencies. Bearing Slip Plates. In theory, bearing slip plates should allow horizontal isolation by their decoupling effect. In practice, for such a design to work at low amplitudes, it would require precision ground, hardened bearings with impossibly small tolerances. The commercially available versions cannot overcome the static frictional forces at low amplitudes to get the bearings rolling at all. In addition, all such systems are difficult to align initially and easily drift out of calibration. Homemade Assemblies. Homemade isolation systems - often a steel or granite slab placed on rubber pads, tennis balls, or air bladders - will work only if the disturbing vibrations are high frequency and minimal isolation is required. While all isolators use the principle of placing a mass on a damped spring, their performance is differentiated primarily by spring stiffness: the stiffer the spring, the higher the resonant frequency. Thus, homemade solutions are limited by their high resonant frequency. A Gimbal Piston™ Isolator with a 1.5 Hz vertical resonant frequency begins to isolate at 2 Hz and can reduce vibration by over 95% at 10 Hz. A tennis ball under a steel plate with a 7 Hz resonant frequency begins to isolate above 10 Hz and reduces vibrations by 90% at 30 Hz. But most building floors exhibit their highest vibrational displacements between 5 and 30 Hz, so that a tennis ball or rubber pad actually makes the problem worse by amplifying ambient frequencies between 5 and 10 Hz. A front support bar is included as standard with all ClassOne workstations.